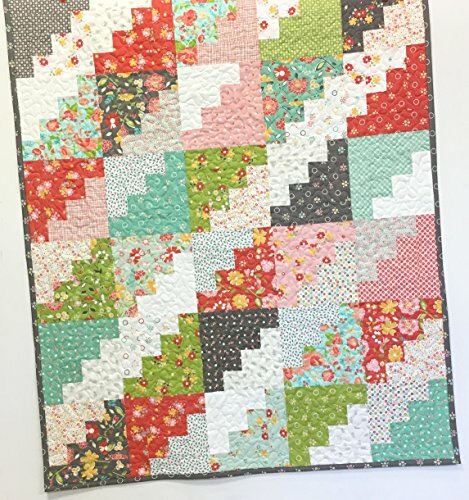 This lovely handmade baby girl quilt has modern colors of Coral, Gray, Aqua and Green pieced in a traditional scrappy log cabin pattern. The Quilt measures 38" by 46", a nice size crib quilt... It has warm and natural batting between the layers. I machine quilted in a freehand meandering and finish with a machine stitched binding around the edges for durability... After completion I machine washed the quilt on gentle cycle using a gentle laundry detergent and tumbled dried on low heat. I love the way the fabrics and batting shrink up around the quilting stitches giving it that soft crinkled look that just makes you want to pick it up and snuggle. Pictures do not capture the true beauty of my Quilts. When you see one of my Quilts in person and hold it in your hands; you will know you have a Treasure... Thank you for your interest.